Fun with filters: Assessing a 400 nm interference filter on a tungsten lamp to improve resolution as an alternative to an LED. Like many hobbyists I enjoy using the affordable range of short wavelength LEDs (deep blue, violet, near UV) for improving the resolution of subjects like diatom frustules. Various LED lighting designs have been described for either modifying existing lamps or for building dedicated lamps (e.g. see the Micscape Library where contributors have shared various designs). A potential disadvantage of using LEDs is that the beam properties don't necessarily match a microscope's field lenses and/or substage optics to fill the aperture of high NA objectives, which can be vital for more demanding studies. The cheap UV LEDs can be underpowered as well for techniques like oblique, unless a sensitive enough camera is used. Below are some comments on a short wavelength filter I've tried compared to a typical deep blue filter. It's very much a 'try it and see' approach (my favorite type of microscopy!). Update: Thank you to a reader who tells me that tungsten halogen bulbs with a near UV block in the envelope are available, depending on wattage and rating. These would not be suitable for the trials below. Consult manufacturer's data sheets for details of extent of near UV protection. Knight Optical interference filter '400FIR12' - 400 nm with 40 nm half bandwidth. Interference filters are available in a wide range of wavelengths and bandwidths. I picked a 400 nm filter which is just on the border of visible and near UV as I liked the challenge of photomicrography just in the visible. I was unsure how much light at 400 nm would be available from a 100W microscope lamp for my camera so chose a relatively broad band of 40 nm at 50% transmittance; filters with 20, 10 nm and lower bandwidths are available. A typical blue LED has a quoted half bandwidth of ca. 25 nm. Large diameter interference filters can be expensive so chose one 10 mm wide for ca. £20. High resolution studies are likely to be using a 40x objective and higher where the field iris when set to just clear the objective's field of view is much less than 10 mm on my Zeiss stand. Safety note - such a filter is for camera use only. The eye is insensitive to and could be damaged by these wavelengths and the filter will be transmitting near UV as well. Most monochrome cameras eg for security use are sensitive to this wavelength for live view focussing. The microscope can be safely set up with a normal dyed blue filter then replaced with the interference filter for camera use. Right: The 10 mm diameter interference filter sitting on the field iris of a Zeiss stand. It covers the field iris diameter for objectives 40x and higher. See eg this link for a description of how they work, to the eye they look like opaque mirrors. 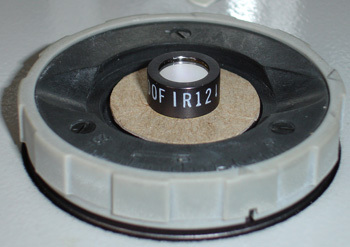 A card stop is used outside the filter diameter because although the iris is stopped down, the filter reflects white light back onto the iris, some of which may be reflected up. Blocking all extraneous light from the lamp outside the filter's transmission band is vital. I tried projecting the light onto white paper but the camera doesn't show its very deep violet colour correctly. Lee acetate filter - '119 dark blue'. This a typical deep blue filter to compare with the above. I preferred this example as Lee publish its spectra; its peak emission is ca. 440 nm and half bandwidth of ca. 120 nm. It comes in some of Lee's 'Colour Magic' filter packs*. To my eyes this is as deep a blue that can be used for visual work although fine detail like diatom punctae I'd struggle to see, this is why cameras are vital. This filter also has a marked near IR transmission so was used with a near IR blocking filter. (*See Ian Walker's Micscape article on Lee's 'Colour Magic - Complementary' filter set, the 'Saturates' set may also be of interest. In UK available from e.g. Speed Graphic for ca. £15). Single captures from an Opticstar PL-130M 1.3 Mpixel monochrome C-mount camera using Micam capture software. (Diatoms on Klaus Kemp's invaluable '8 form' test slide, Hyrax). Frustulia rhomboides, Zeiss 40X NA0.75 Neofluar (ph) - oblique using offset brightfield port in phase condenser. 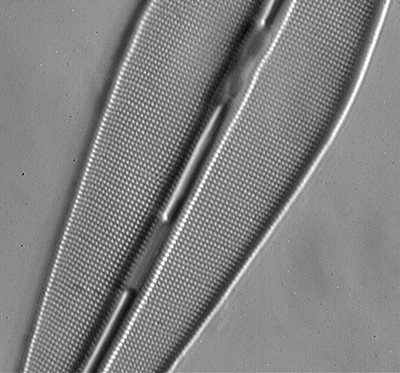 The diatom long axis is ca. 45 degrees to direction of oblique. The camera isn't very sensitive but only needed 7V (with oblique) on a 12V 100W lamp to expose with the interference filter (dark blue used 4V). Left above - Green filter ca. 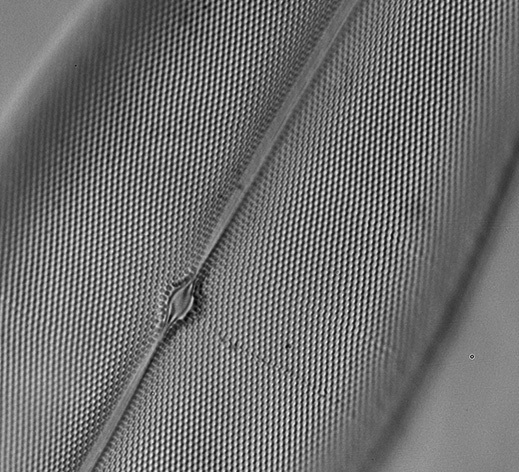 550 nm (internal filter on Zeiss Photomicroscope III) - a hint of frustule detail. Right above - Lee dark blue filter 440 nm - some evidence of punctae and 'beaded striae'. Above - 400 nm interference filter, punctae clearer over whole frustule cf the deep blue. Amphipleura pellucida, Zeiss 40X NA1.0 oil apo, dry condenser - oblique using offset brightfield port in phase condenser. 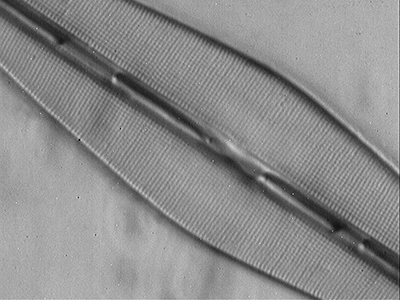 The diatom long axis is parallel to direction of oblique. Lee dark blue filter - very slight hint of 'striae' at left. 400 nm interference filter - 'striae' quite clearly shown. Above: The LOMO 40X NA0.95 dry apo is also able to show the striae in oblique with the 400 nm filter. 'Striae' are the accepted appearance of unresolved punctae under the optical microscope, they are not real features on the frustule. For Amphipleura pellucida they are typically reported to be 0.28 µm apart, and thus resolvable at 400 nm by an NA 0.95 objective from the Raleigh equation (Resolution = 0.61 l / NA ). Frustulia rhomboides, Zeiss 63X - slight oblique using offset brightfield port in phase condenser. Left: Lee dark blue filter ca. 440 nm the punctae are resolved, but decreasing the wavelength to 400 nm (right) the image look crisper and more contrasty. If my Nikon DSLR with CMOS sensor is typical, a DSLR seems sufficiently sensitive to this short wavelength and narrow band output from a 100W microscope lamp. Apart from extreme oblique there was plenty of light for Live View to compose and focus. With 100W lamp at 7V, a 2 second exposure at ISO 200 was needed, the sort of exposure I'd use anyway at high mags to avoid camera vibration. 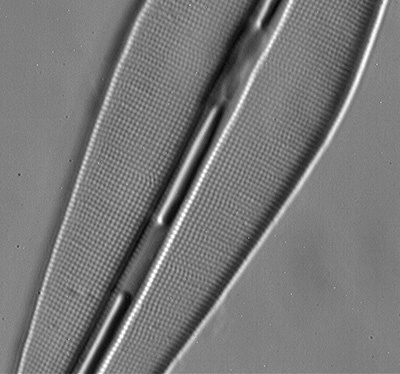 As with the earlier images, diatoms tend to have flat tonality so the histogram needs adjusting. Images were best converted to monochrome as in colour they were a pale looking violet. Pleurosigma angulatum, 400 nm interference filter, Zeiss 63x oblique using offset brightfield port in phase condenser. IS0 200 2 secs, crop of frame. Amphipleura pellucida, Victorian unnamed strew, 'Richmond Park', Sirax. Zeiss 100x NA1.3 Neofluar (Ph). Oblique using offset brightfield port in phase condenser. 400 nm filter with DSLR. 'Beaded striae' and some evidence of punctae resolution in places. A narrow band 400 nm filter looks useful for extending suitable objective performance with the microscope's tungsten lighting, with a quick switch from visual to short wavelength camera work by just adding the filter to the field iris. Normal size interference filters (eg 25 mm) are expensive but small ones just sufficient for the field iris aperture at higher mags are more affordable. Quite modest NA objectives may give noticeably better results than with a typical deep blue glass / acetate filter and far superior than with green. The choice of objective can be important; 'fluorites / semi-apos' and apos which are corrected for spherical aberration for blue may be suitable. The emission at 400 nm is smaller at lower filament temps, so 100W lamps would be most suitable although was under-running the Zeiss lamp. So lower wattage lamps may be sufficient if a camera is sensitive enough. I also tried a LOMO 6V / 15W lamp and gave sufficient output with the camera used when set at full gain. Although suspect it was using the upper end of the 420 nm band transmission at the low colour temp of ca. 2850K. Using a 400 nm filter can't match the striking results some enthusiasts have been sharing with LED lighting emitting as low as 365 nm (near the transmission limit for normal glass optics), but for the hobbyist who doesn't wish to venture into non-visible wavelengths, a 400 nm filter can be worth a try. For hobbyists looking for a narrow band deep blue - violet filter without going as low as 400 nm, a slightly higher wavelength interference filter for 420 nm could be tried with potentially higher light output from a tungsten lamp eg Knight Optical's 420FIB12 which has a similar bandwidth to an LED. I'd be interested to hear of what short wavelength filters on a tungsten lamp other enthusiasts have found useful and cameras used. Published in the August 2008 edition of Micscape. ï¿½ Onview.net Ltd, Microscopy-UK, and all contributors 1995 onwards. All rights reserved.